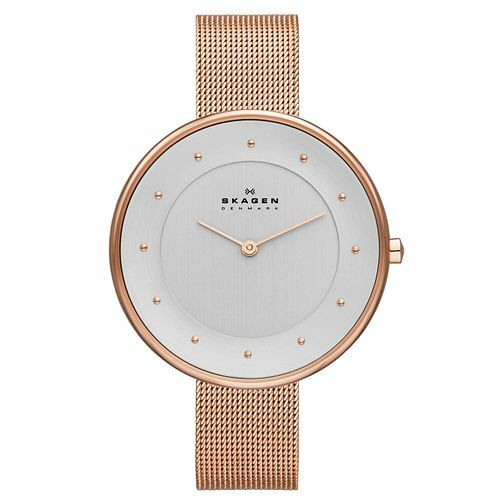 Get timeless and simple Danish design with this ladies' watch from the renowned Klassik collection by Skagen. Featuring a crisp white dial with warm rose gold tone hour markers, and finished with an intricately woven mesh bracelet strap in stunning rose gold tone stainless steel. The perfect watch for sleek, minimalist style. Skagen Ladies' Klassik Rose Gold Tone Mesh Bracelet Watch is rated 5.0 out of 5 by 3. Rated 5 out of 5 by Anonymous from Love the watch Very elegant looking, and the rose gold is a lovely gentle colour. Rated 5 out of 5 by Anonymous from Very elegant, simple design Beautifully elegant watch, stylish and easy to read, looks more expensive than it is!